Medicaid is a critically important program that pays for more than 50 percent of births in the United States, and covers four in ten Texas children and virtually all Americans with life-long serious disabilities. Kicking people out of the program who would be better workers and parents if they had healthcare will have damaging impacts on public health and American poverty. Read our new policy brief on why Medicaid work requirements are bad medicine for Texans. Shortly after the announcement from Medicaid officials that adults in the Medicaid program who don’t have a job – or don’t submit proof of their work on time – could be kicked out of the program, the federal Centers for Medicare and Medicaid Services (CMS) also gave permission for Kentucky and Indiana to impose work requirements and deny health benefits to those failing to comply. #1 It’s Not Just Work Requirements: Medicaid Lock-outs, Delays, and Lifetime Limits are all on the table now. Work requirements, time limits, and denials of coverage are largely justified by their proponents based on incorrect assumptions about work, poverty, and who receives Medicaid. Most adults on Medicaid are actually working—and those not working have good reasons for not doing so. #2 Most adult Medicaid enrollees are already working. The notion that a work requirement for “non-aged, non-disabled” adults on Medicaid is needed at all is at odds with the reality that the substantial majority (60 percent) of adults enrolled in Medicaid today are working—more two-thirds of them full time. Thirty-two percent of the remaining adults are either ill, have a disability, are in school full time, or caring for children or an adult with a disability. Only 7 percent are “non-working” for other reasons. #3 Full time work does not include health benefits for many Texas adults, and families headed by workers are too often still in poverty. Behind the push for adult Medicaid work requirements is the incorrect belief that gaining full-time employment will bring with it employee health benefits. A top federal Medicaid official said, “people moving off Medicaid is a good outcome because we hope that means they don’t need the program anymore.” According to the U.S. Census, 54 percent of Texans (and 59 percent of Americans) under age 65 had employer-sponsored health coverage in 2016. #4 Several states without Medicaid Expansion have already asked federal permission to add work requirements: Kansas, Mississippi, Maine, Utah, and Wisconsin. In most of the 18 states (including Texas) that have not expanded coverage, the adults facing new work requirements would be low-income parents, and former foster youth under the age of 26. It is too early to know whether states like Kansas and Mississippi, which cover only a small number of parents in Medicaid will gain federal approval to apply work requirements to such a small group in such deep poverty. But, it is important to know that some states are considering it, and it is not only “single, childless, healthy adults” who may be facing these new work policies and potential time limits. #5 Texas Medicaid today covers only a small number of extremely poor parents. In December 2017, fewer than 147,000 Texas parents in poverty received Medicaid, compared to over 3 million Texas children. Because Texas Medicaid covers only a small number of parents, and covers no poor uninsured adults without dependent children (i.e., we cover only seniors and adults with disabilities in poverty), our current Medicaid program resembles those of Alabama or Mississippi more than Maine or Wisconsin. #6: Legality of Medicaid Work Requirements, Time Limits is in Question. Until now, imposing a work requirement has been widely believed to violate the Social Security Act requirement that section 1115 waivers must further the specific goals of the Medicaid statute, which are limited to providing health care and do not include other societal or governmental goals. The Trump administration’s CMS leadership argues that evidence of better health among employed adult Medicaid enrollees is caused by that work, and not simply a reflection that healthier enrollees have a greater ability to work. To learn more about each of these points, read our report on why Medicaid work requirements are bad medicine for Texans. What’s next? Stay tuned to CPPP and the Cover Texas Now coalition’s website for more updates on this issue as it affects Texans. 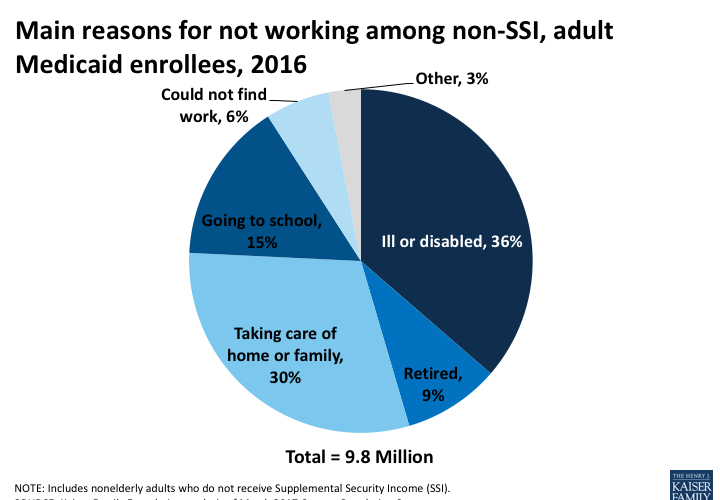 Work requirements are not being applied to Supplemental Security Income (SSI) beneficiaries in Medicaid, which includes both people aged 65 and older in poverty, and those under 65 and in poverty with a serious disability.